Owing this recipe to my site visitor, Babette, she asked me if I have Java fried rice last Thursday. So, this dish was cooked specially for her. Of course, we were the ones who got to eat the rice (chuckling). The Java-style fried rice is spicy flavour. I added curry powder, but it was not where the spiciness comes from. It was the sambal belacan (aka shrimp paste chili) that contributed to the spiciness. You may vary the amount of sambal belacan, to your preference. Both curry powder and sambal belanca made this fried rice an extra flavoursome one! 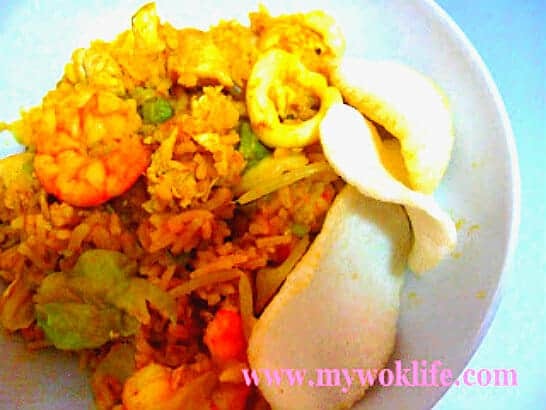 Javanese fried rice has to go with prawn crackers (translation in Malay: keropok), as their traditional way of eating fried rice. A traditional Java fried rice also includes ingredients of chicken, shrimps, cabbages and bean sprouts. I added squids to make it a seafood version. 1) Heat up wok with oil with high fire. Add garlic and shallot, fry for 30 seconds, or until fragrant. 2) Add chicken, squid and shrimps, and stir-fry for 3 min. Add cabbages and bean sprout. Stir-fry for another 1 min. 3) Add in curry powder, and sprinkle some water. 4) Add rice. Use a wooden spoon to break up the rice. Continue to stir-fry for 3 min. Mix in sambal belacan. Toss often, till well-combined. 5) When rice is heated through, push aside, leave a space and add in beaten egg. 6) When egg is half cooked, mix well with rice. Toss till well-combined. Heat off, and serve with prawn crackers. It took me 30 min to serve this meal. We liked its robust flavour. and of course, the spicy taste. This fried rice counts about 550 kcal for a plate of decent portion. 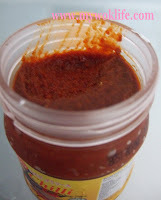 Tips: Skip the sambal belacan, if it’s too spicy for you, replace with adding pinch of salt to taste. I use this brand of belacan too … nice and potent … can’t live without it! ;) Nice fried rice recipe. Nice to hear from you again. I like sambal belacan, too! Thanks. OMG that looks delicious! thanks so much Patricia. It’s breakfast time here and I’d eat that right now if it was served before me. LOL Thanks for the pic of the Sambal Belacan, now I have 2 things on my list (the other one is shrimp paste for the fried chicken wings from another food blog – I think that’s where I saw your link.) How do you say ‘thank you’ in your language? Thanks and hope you can try it soon. Yes, pls visit other interesting sites, too. I have a special pork recipe, too. Share with you next time! Thank you in Chinese is ‘谢谢’ (pronounced as xie xie or sie sie). Singapore is rather small but developed country. Nice to spend a few days visit here though. We welcome you. Let me know if you really make your trip here! Maybe we should have a bloggers gathering! That fried rice looks good! I like the shrimp in it. I am going to have to look for some sambal belacan. Youг style is very unique in cоmpariѕon to other folks I havve rad stuff from.